Do you have a strong preference for certain activities? If that’s the case, you can choose from a large number of one of the daily programs at Kabalebo Nature Resort. Each program is built around a certain activity. Of course it is also possible to make a reservation for one of our fixed packages. Thanks to the individual daily programs, no day and no stay at Kabalebo Nature Resort will be the same. During your reservation you can specify whether prefer a stay, based on the single day programs – or just want the fixed set of pre-filled activities. The trail to the BWKW rapids. A trail from the feet of the Misty Mountain to the Sand Creek. These trails are in combination with a boat trip in a dugout canoe. After the hike, you will have the opportunity to relax in the river. In the afternoon, we will drift back to the lodge and while drifting back you can enjoy the wonderful nature surrounding you. In the evening dinner will be served, and you will be able to enjoy one of the delicious Surinamese courses that the cook/chef has prepared for you. After dinner, you can enjoy the scenery on the spacious veranda or relax in your hammock. After dinner, the manager will provide you with information about your tour for the next day. After breakfast, you depart for an adventurous walk through the rainforest and a climb to the misty mountain, which takes about 5 hours during which you may spot wild life. It is a guided tour and the main goal is to reach the top of the misty mountain with a breathtaking view of the pristine rain-forest. Lunch at the top of the mountain and on your way back we will stop at the Charlie Falls, where you can relax. After returning to the main lodge, you can cool off at the swimming pool and enjoy the scenery surrounding it. Soon after breakfast, we will start our tour by drifting with the dugout canoe to the trail that leads to the Moi Moi falls. When you have reached the trail that leads to the Moi Moi falls, you will start with an educational walk through the rain-forest with a guide. 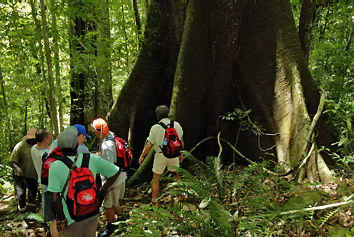 The knowledge you have already gained about the tropical rain forest becomes even more interesting during this guided tour, lunch will be at the falls. 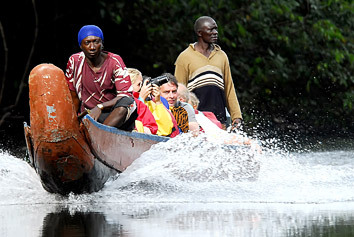 In the afternoon, we will make our way back to the Main Lodge by boat to spot wildlife. After the tour, most of our guests retreat to the swimming pool to relax until dinner is ready. After dinner, the manager will provide you with information about your tour for the next day. 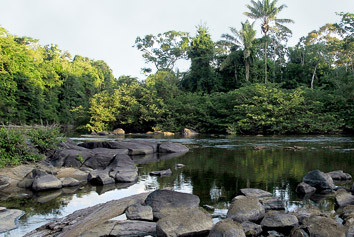 After your breakfast, you quietly drift down the stream in a corial to Kilo 3 creek, where you will go on an interesting forest walk to the Kilo 3 rapid. Here you will lunch and relax in the creek. 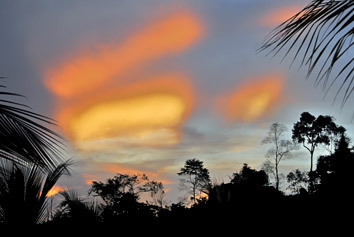 Late in the afternoon, we will make our way back to the Main Lodge and experience the rain-forest come to life again. After the tour, you can lie in a hammock or relax at the pier until dinner. After dinner, the manager will provide you with information about your tour for the next day. Breakfast, today you set off for a 2 ½ hours hike to the Bivouac camp were you will have lunch. After lunch we will go on a boat trip into the Zandkreek to get to the rapids were you could enjoy the water of the creek. It will take you 1 hour and 45 minutes through lush vegetation other than you have seen so far. In the afternoon, we drift back to the Main Lodge. After dinner, the manager will provide you with information about your tour for the next day. After breakfast, you set off to go on a 2 ½ hours boat trip to the Was Wasie rapids. 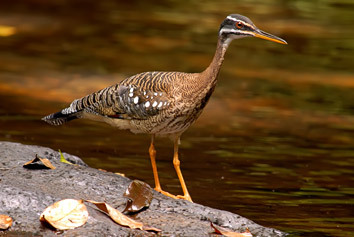 On your way to the Was Wasie rapids, you can enjoy the beautiful nature and animals surrounding you. Here you will have lunch and you are welcome to relax in the river. In the afternoon, we will make our way back to the Main Lodge and enjoy nature in its fullest. You will start your last day with a breakfast after which you will go kayaking. We will make our way upstream to the Krong Soela by dugout canoe. When you arrived at Krong Soela you will step in a kayak and paddle your way back to the main lodge. 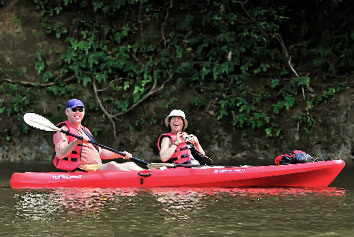 While kayaking, you can enjoy the nature and the wild life around you. After lunch, you will fly back to Paramaribo. 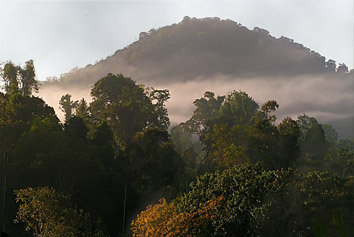 Kabalebo Nature Resort offers many diverse packages. The peace and tranquility of our property makes it a suitable place to get in touch with your inner self. Since we understand that the daily hustle demands creates the need for a package with that little extra attention every once in a while, we especially developed the “private/ tailored package”. This package is designed for those who want a break from their daily routines and wish to boost their inspiration. We offer you the opportunity to enjoy nature, the resort and the river at your own pace and really relax and find your purpose again. The “private/ tailored package” is personally customized and very flexible. It’s goal is to completely unwind and release all your stress and leave with a sense of peace. The private package is based on a two-person occupancy, private guide and boat.